Giraffes spend about 80 percent of their day eating and they are said to be able to eat up to 77 pounds (35 kilograms) of food a day. Their favorite tree is the thorny acacia, which provides them all the necessary nutrients they need. The high water content in the leaves and fruit they eat even make it so they don’t need to drink water much at all as long as they’re eating enough. Regardless, they can go weeks without drinking water, longer than even camels, which is just as well because they have to bend a long way down to get a drink and water holes can be dangerous places in the wild. 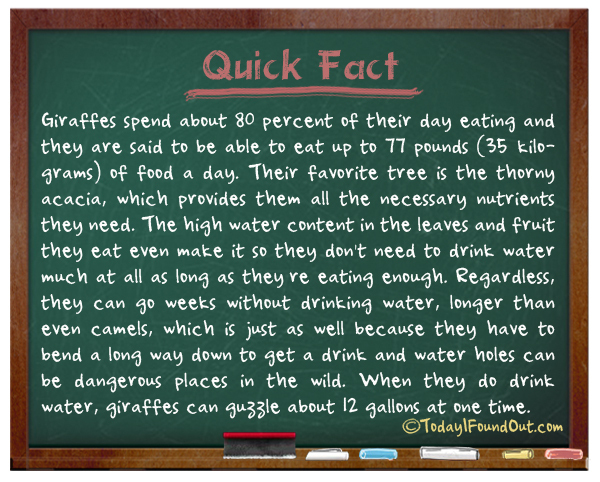 When they do drink water, giraffes can guzzle about 12 gallons at one time.